McALLEN — Staff at Whole Woman’s Health dressed up Thursday night in quinceañera gowns to celebrate the abortion clinic’s 15 year anniversary. Located on a corner in the city’s downtown, it’s the only abortion clinic south of San Antonio and one of just 20 in Texas. Hagstrom Miller bought the clinic in 2004 from Dr. Pedro Kowalyshyn, a physician who began performing abortions on top of the family planning and women’s health services he already offered, after a 1973 Supreme Court decision legalized abortion nationwide. 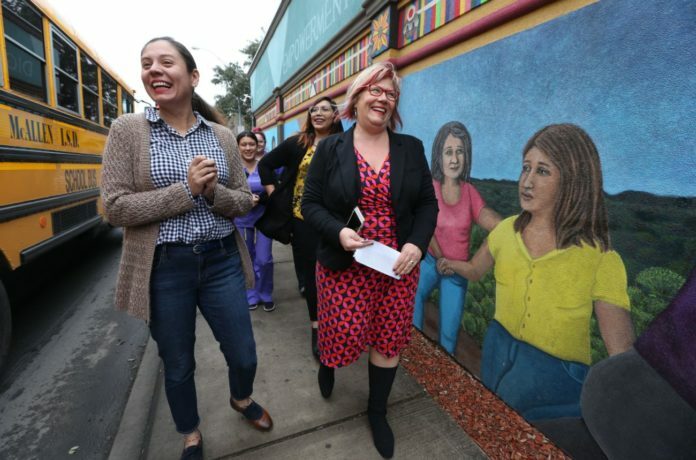 In the years since the clinic became Whole Woman’s Health of McAllen, it has faced not only attacks from anti-abortion protestors who frequently gather outside, but also from the Texas Legislature seeking to further regulate the legal procedure. In 2013, Texas passed House Bill 2, which required abortion clinics to meet hospital-like standards and required doctors who perform abortions to have admitting privileges at a local hospital within 30 miles of the clinic. Whole Woman’s Health, which currently operates seven clinics across four states, sued. While the case played out in court, the clinic briefly closed until it got a temporary federal injunction allowing it to stay open. Meanwhile, the two closest clinics in Harlingen and Corpus Christi closed completely due to the increased regulations. “All eyes were on McAllen, watching us really define what an undue burden means and what regulations really mean as they play out for people in real life,” Hagstrom Miller said. The case eventually made it to the Supreme Court where in 2016 justices ruled the state’s abortion restrictions placed an undue burden on women’s constitutional right to abortion. “It’s really moving to see the combination of a clinic that is small and rooted in the community but that can also be so mighty in its commitment to do the right thing, said Andrea Ferrigno, corporate vice president of Whole Woman’s Health and niece of the clinic’s original owner. Last year, Whole Woman’s Health of McAllen served 3,651 patients who received surgical and medical abortions, pregnancy testing and counseling, ultrasounds and gynecology care, according to Hagstrom Miller. At least 45 percent were from the McAllen and Harlingen-areas, with another 20 percent from the Brownsville-area. At least 15 percent traveled more than 100 miles to receive care at the clinic. The organization credits community volunteers who work as clinic escorts, ensuring women aren’t threatened by protestors as they make their way inside, with supporting the clinic over the last 15 years. According to the Pew Research Center, 58 percent of those polled in spring 2018 said abortion should be legal in all or most cases. Whole Woman’s Health is currently the lead plaintiff is three different lawsuits against the state, two against Attorney General Ken Paxton and the third against the executive commissioner of the Texas Health and Human Services Commission. The lawsuits are challenging the state’s ban on dilation and evacuation, the most common second-trimester abortion procedure; dozens of burdensome state abortion regulations, including a 24-hour waiting period between receiving a sonogram and getting an abortion; and the fetal burial rule. Despite the fact that Texas lawmakers continue to work to restrict access to abortion, Hagstrom Miller emphasized that Whole Women’s Health of McAllen isn’t at risk of closure. “There’s nothing that would lead this clinic to close at this point,” she said. “We look forward to the next 15 years and for us to continue to fight the good fight and stand on the right side of history,” Ferrigno added.